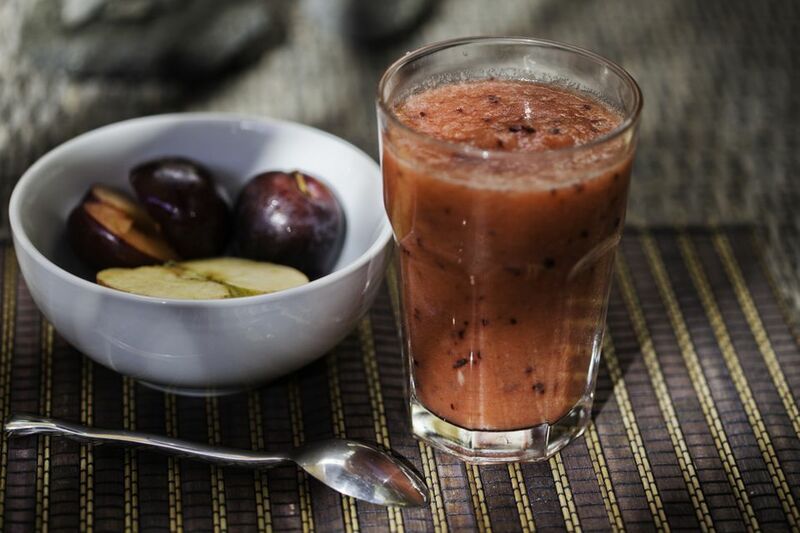 When it comes to fruit smoothies, plum may not be the first flavor you think of. But this stone fruit should not be overlooked when it comes to making the healthy blended beverage as it turns into a sweet and tasty drink. And when ginger is added, it actually soars to a whole new level. This smoothie is the number-one reason to freeze plums when they are in season. Fresh plums are perfectly fine here, but frozen plums thicken up the smoothie nicely. To freeze plums, halve and pit the plums, then cut them into wedges or chunks and freeze them with their skins on—the peels add great color and tart flavor to the smoothie. Put all of the ingredients in a blender and whirl until smooth. Let the blender run long enough so the mixture is truly smooth—this is especially important when using frozen plums; you need to give them a chance to get processed. Pour mixture into a glass and enjoy. Plums are in season from May to October and come in several varieties and ranges of color. When buying plums at the farm stand or grocery store, you should look for fruit with smooth skin that is free of blemishes and discolorations. It shouldn't be wrinkled or have any soft or mushy spots. The grayish layer on the skin is perfectly normal and should not deter you from purchasing. Once you bring home your ripe plums, store them in a plastic bag in the refrigerator for up to 4 days. If they are a little hard, you can leave them on the counter to soften. Once the plums are ripe, if you are not going to use them within a few days, you can freeze them and use within a year. To pit plums, first cut in half, twisting the fruit to separate. Then, using the tip of a knife or your fingernail, loosen the pit from the half. If you have difficulty dislodging it, slice a piece or two from the half and try again. You don't want to force out the pit as this can damage the flesh.